Ramona is a rural, unincorporated community in central San Diego County of about 35,000 people situated in a picturesque valley. Ramona Chamber of Commerce’s executive director Dr. Robert Argyelan said the fastest growing industry in the Ramona area is related to wine production, from family-owned vineyards to tasting rooms. 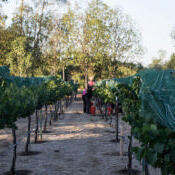 At least 18 federally bonded and state-licensed wineries can have “Ramona Valley” on their labels, as at least 85 percent of their grapes are grown in the region. Homes in the North County are staying on the market longer, prices have dropped slightly, but interest rates are still low enough to attract buyers. The Daily Transcript, in collaboration with Dr. Robert Brown, an associate professor of economics at California State University, San Marcos and the North San Diego Association of Realtors, provides this daily section of housing information. This data tracks the housing market of four ZIP codes each day and allows businesses and investors to visually analyze selected areas of San Diego County. Wide, open spaces make Ramona a prime destination for agriculture and tourism.